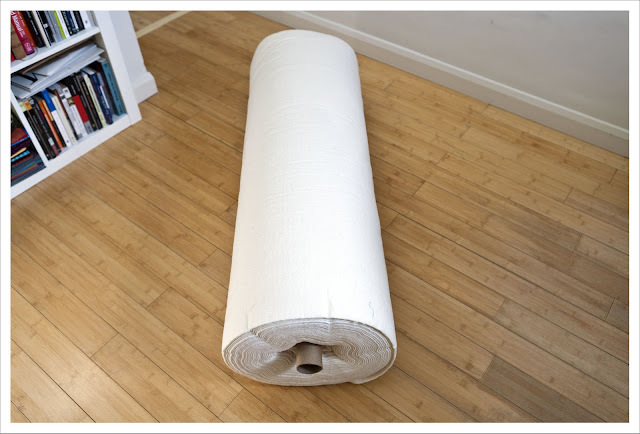 I thought I use the occasion of me purchasing my second ginormous role of wadding to share with you some thoughts on wadding. I will make this a little mini-series on wadding. Today I want to talk about the prize of wadding and the next two posts will be on the different types of wadding and on how to make wadding last longer. Luckily judging by the answers I hadn't and I was amongst many who economize in the same manner. When I started quilting at first I bought pre-packaged wadding such as 'Hobbs Heirloom' but I was never happy with the stuff. It comes in what is called common sizes, such as crib, twin, queen and king but often my quilts are not necessary of common size and I end up with awkward leftover pieces. 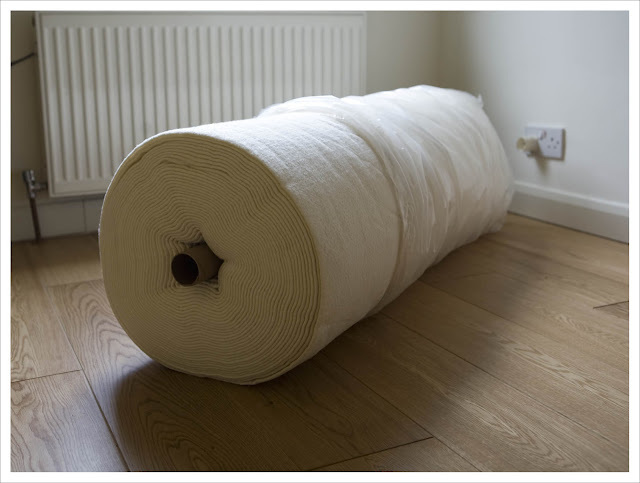 Although this wadding it of good quality, it comes tightly rolled and therefore takes forever to lie flat and it is expensive for what you get ( GBP 7 for a crib to about GBP 30 for a king size quilt). Then I discovered that I could buy wadding by the meter at my local quilt shop Tikki. I chose 'Quilters Dream Select' which is a fantastic wadding, has medium loft, is super soft and is a 100 % cotton. Although this gave me much more flexibility I still wasn't happy because this wasn't inexpensive either with around GBP 6 per square meter. 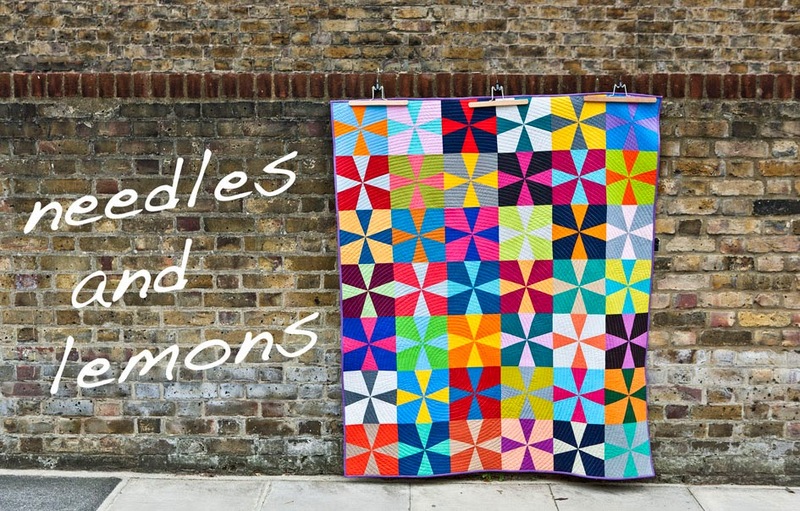 If you want to sell quilts as I do you have to try and keep your costs low (Actually whether you sell or not, we all want to try and keep our costs low). Each of us know that we never get all the hours paid we spend making a quilt but that should not stop us trying to make it as cost effective as possible. So eventually I bought my first roll of wadding for myself. The first one was bought at Creative Grid and the second one at my local quilt shop (via Creative Grid again). My now favorite wadding is the 30 yard role of Hobbs Heirloom Natural 100 % Cotton wadding with scrim 96" wide (more on this type in my next post). This is very similar to the QD in texture and quality but perhaps a little bit thinner. The role costs 205 GBP and yes I know this is a lot of money to spend in one go but it really lasts forever and it is the most cost efficient way of buying. If you calculate the price per meter you end up with about GBP 3 which a lot less then the meter price you have to pay when you buy pre-cut or off the role. If your budget doesn't allow to spend this kind of money then another option is to share a role with a quilting friend (preferably one that lives local so you don't have to drag the beast far) and then the price looks a lot more agreeable and you still find that it will last forever. This is now my second role and hopefully this will last another 2 years or so like the first did. I think I made close to 50 quilts with the first role and if you are familiar with my work then you will see that most are bigger sized quilts. There is a downside to buying a role and that is the issue of storing the beast. I have a shoebox of a house and have no real storage place for it. Mostly it lives in my spare room downstairs but as my sewing space is upstairs I tend to drag it up there and then put it in my bedroom. Not terrible convenient I must say but I think I have a solution. I will un-role half of it and make a second role and then both will fit (hopefully) under my bed or I put one half role into the loft. I hope this was informative for you and I would be very interested to know on how you buy your wadding. Thank you so much for your blog post, I have often wondered what the cost of a whole role would be. I am only beginning, so I'm not certain I could justify the outlay. I'm starting to think about saving up for a roll of wadding. I seem to be using the Quilter's Dream Select the most, is the Heirloom one you buy thinner or thicker than that? I like some loft to my quilts and have found the others I've tried too thin for my tastes, I'd actually like something a tad thicker than the Select but I've not found a 100% cotton one yet that fits the bill. My sewing room is a teeny tiny box room so I won't be able to buy a roll until we move house as there is absolutely nowhere to store it here. I was thinking the other night (as you do!) that I could try and see if my Dad would make a stand for me like you see in quilting shops to store it when I do eventually get one, that way at least it wouldn't roll away! Anna the Heirloom is a little thinner as the select I think but not by much otherwise I would not have chosen it. It is of the same excellent quality though and not comparable with the Hobbs Heirloom that comes prepackaged which I think is almost see-through. Judith, I'm a big fan of the Quilters Dream Select wadding that you first bought. Now that you get the Hobbs Heirloom how does that compare? Is it not a good bit thinner? The precut hobs stuff I've tried has seemed almost transparent in comparison with the Quilters Dream Select. I'd love to hear what you think, as I'm always interested in a cheaper wadding if its just the same!!! Sarah, Hobbs Heirloom is very similar to the Quilters Dream Select but a little thinner. Not much though. I agree he pre-packaged stuff is almost transparent compared to the Quilter's Dream and to the Hobbs Heirloom on the role. I suggest you look at your ceiling space and consider hanging your roll of batting (as we say) on a pulley device that you could handle on your own, only needing help in getting the roll mounted. I totally agree with you and the Heirloom out of the pack. But the Heirloom from the role is from a texture point of view exactly like Quilter's Dream but just a little thinner. This is very interesting - I've thought about getting a roll if batting before so it's good to know the costs. I'm especially interested to hear that the stuff on the roll is thicker than the pre packaged stuff, which I've used before but found a bit thin for my taste.